Imaging studies suggest that individual differences in cognition and behavior might relate to differences in brain connectivity, particularly in the higher order association regions. Understanding the extent to which two brains can differ is crucial in clinical and basic neuroscience research. In a recent exploration, we found that inter-subject variability in functional connectivity demonstrated a unique distribution across the cortex, which is also related to the hemispheric specialization of brain functions. We hypothesize that the cortical surface expansion during human evolution may have led to remarkable inter-subject variability in brain connectivity. We propose that a series of changes in connectivity architecture occurred in response to the pressure for processing efficiency in the enlarged brain. These changes not only distinguish us from our evolutionary ancestors but also enable each individual to develop more uniquely. 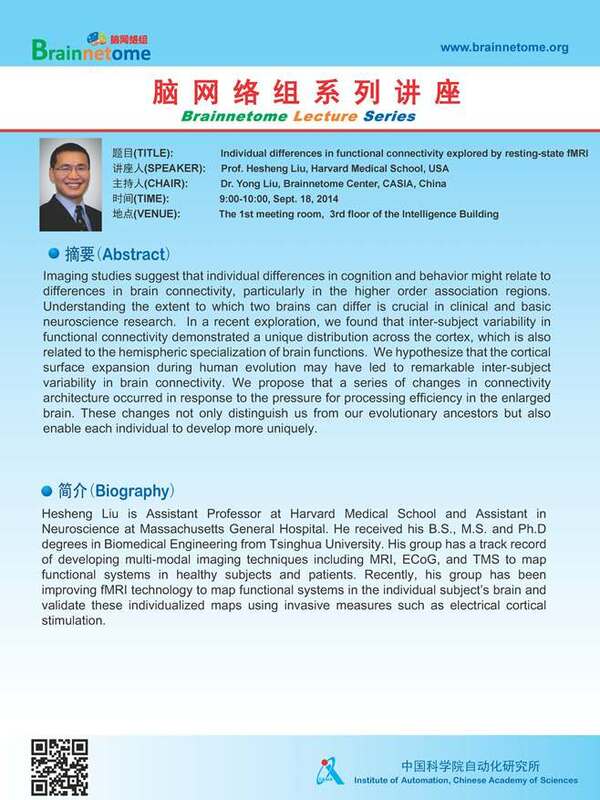 Hesheng Liu is Assistant Professor at Harvard Medical School and Assistant in Neuroscience at Massachusetts General Hospital. He received his B.S., M.S. and Ph.D degrees in Biomedical Engineering from Tsinghua University. His group has a track record of developing multi-modal imaging techniques including MRI, ECoG, and TMS to map functional systems in healthy subjects and patients. Recently, his group has been improving fMRI technology to map functional systems in the individual subject's brain and validate these individualized maps using invasive measures such as electrical cortical stimulation.